We all have those boys in class who struggle to write and stay focused when writing. Why is this the case? This blog is a journal of my investigation into what motivates boys to write. The focus is on discovering if giving them more choice and ownership makes a difference. Well it has been another amazing year being a teacher and being privileged enough to spend my days with so many awesome kids and colleagues. A big thanks to the Manaiakalani Trust and the Telecom Foundation for giving me some time this year to focus on an inquiry into something that I am really interested in and that is very real to my students. My boys have benefited immensely from my inquiry becoming far more aware of their learning in writing and thinking deeper about how they can improve. The girls have also benefited because they have been caught up in the slip stream of the inquiry as well. I feel like this year was successful but also that the things that I discovered will benefit my students next year more so than this years group. The strategies I learned to really push cognitive thinking are going to benefit the kids when exposed to them for a whole year and not just half a year which is what happened this time around. Variety - give students choice and ownership and change things up even if its just slightly. Learning Progressions - give the kids clear learning progressions that they understand and are in their speak. Honesty - show them where they are and where they should or could be and encourage them to share with others. Excellence - show your students what excellence looks like. Share good pieces of writing above their level to give them something to aim for. Environment - provide an environment where the kids are comfortable and where they have options of where, how and who they work with. They love new furniture or moved furniture. These are just some of the things that I will take forward into next year and continue to inquire about. Now that I have started down this road I know I will continuously be searching for the answer to the question, 'What motivates boys to get better at writing?' I know for sure I am am still trying and as you can tell my punctuation and grammar need some real work. Next year I am shifting to a new school with a different demographic of students, so I am really looking forward to seeing how much of what I have learnt about my kids this year can be transferred to my new school. I'll let you know! This is a copy of the presentation I gave at Ulearn 2013. It does have some notes that go with it, so it is not exactly what was shown or talked about but gives and overview. Mindcraft Rulez! This was a statement from one of the boys in my class and I just had to share. He keeps referring to this highly engaging learning tool as Mindcraft, which I think is quite appropriate really. This year we have embraced the craze of Minecraft and are seeing some rewards for doing so. We came to the conclusion, as teachers battling to keep students on task and not sneaking into enticing places like Minecraft, that if you can't beat them, then why not join them! The boys were the ones who were using the game at home and were enthralled with it, but the girls have become just as enthusiastic about it. This week we have been integrating the tool in literacy and the boys have been so engaged in inquiring, writing, creating and sharing what they have learnt. We have been learning about Myths, Legends and Fables this term so this week we have been investigating where these stories originated. We began by inquiring into the origins of the Myths, Legends and Fables and recorded our findings to be used in a voiceover for a movie. Following this we have re crafted in Minecraft, buildings that were built in the times that the stories were written, and then added a voiceover that explains where the Myths, Legends and Fables originated, information about the building and finally comparisons of life then and now. This week we introduced a new reward system which rewards those who have been engaging cognitively in their learning with the opportunity to have some free time. Most of our first weeks winners chose to spend time on Minecraft which was great but did cause some rather major distractions for those who did not get any free time. So out came the sheets and these huts were built. They worked a treat and the kids underneath thought it was brilliant. As you can see in the picture on the right, it is as if they don't exist at all. Last week I found some plywood and someone was nice enough to cut it up for me. 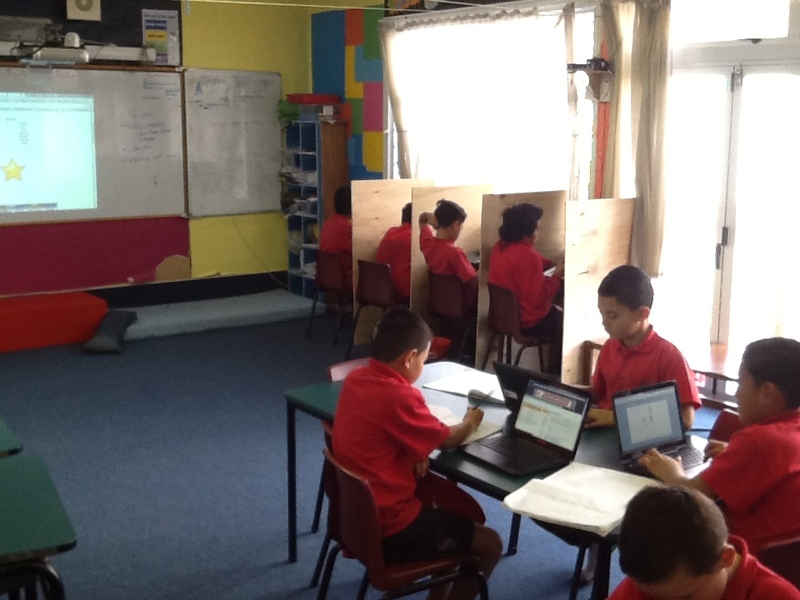 So now we have a row of study booths for the kids to use if they want to focus and get away from distractions. First day, nobody went near them but now the boys are loving it. They still lean around and have a chat every now and again but they are far more focused. The boys are choosing to sit there themselves and they just come and go throughout the lesson. So this all came about after noticing that some of the boys really struggle to get away from friends who distract them. They aren't strong enough or don't feel confident enough to ask their friends to be quiet. Alternatively they get distracted by looking at their friends work and seeing that they have done more than them and so start to worry. Basically the idea is to give the kids options of places to sit. They are now appreciating the benefits of each space and will move around depending on their needs at the time. 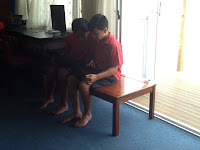 I will add more photos of some other spaces the kids have been using and some new ways of using coffee tables. My plans are to explore collaboration in writing latter this term or next, but I did get a little taster for it this week. Our goal for a task was to use a variety of sentence lengths (they tend to write a lot of short sentences) and I let the kids do this in pairs. I asked them to come up with three sentences to make a paragraph. They also had to do this verbally as apposed to writing it all down, which they did do latter in the lesson. We haven't done it for while and the kids seemed to really enjoy it. Their was some great conversation going on as they worked together to create what they thought was a good paragraph. I then asked them to share their paragraph to another group and allowed the other group to be critical. The result of this was more good debate and collaboration which culminated in paragraphs that had a variety of sentence lengths. I wonder how this would work for a whole piece of writing for something like a narrative? I'll give them a chance to this for sure. Teaching in a 1:1 device environment brings its own challenges and one of those that really influences boys writing is digital competency. This year I have a mixed year level class, so therefore have a group of kids that have been learning in a digital environment for a year, as well as a group of kids who are new to the environment. It is very hard not to think back to the learning and the skills my class had in term four last year and expect the same at the beginning of the new year. Big mistake on my part. How can I expect my year five boys to produce quality pieces of work when they don't have the digital literacy to do so just yet. It's really hard for them to think solely about their writing when they are also just discovering the ins and outs of their netbooks and Google Docs. On the flip side it is great that my year six kids are flying and they were able to come back to school and get straight into it. All is not lost with my year fives though, scrolling through their blog posts I notice that the quantity and quality of their writing is improving from the beginning of the year as their digital literacy improves. This term to give my research some structure I have planned my term as you can see above. I didn't want to add to many variables at once otherwise it will be harder to tell what influences writing and why. It also makes it more manageable in the classroom environment. My key variables that I am planning to compare this term are the noise of the environment the boys write in, and how having choice influence on the quality of writing. So as you can see above each week I will change a variable and see what happens. I will also latter in the term compare writing samples for five boys across the term. Next term or maybe latter this term I am going to also focus on collaboration, competition, feedback/feedforward and sharing medium to see how these variables impact on their writing. The past two weeks I have been enforcing a very strict silent time for 20 minutes at the beginning of writing time. This is not the easiest thing to do considering our class is an open learning environment with 90 kids and three teachers. It can get quite noisy! We normally have quiet time but this has been more test conditions. I didn't feel that good enforcing it at the beginning because I value collaboration but after seeing how productive the kids are I started to feel less uncomfortable. 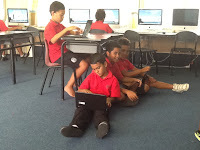 The kids were all very engaged and in their own writing worlds. After twenty minutes two kids said they were finished and others started to stir so I called them back to the mat and asked them what they thought of the silent time. Of the 26 kids only two said they didn't like it, one because he wanted to talk to his mates and the other because 20 minutes wasn't long enough. The rest said they really liked it because they could focus on their work without any distractions. I sent them off after this to carry on or to start editing their work with a buddy and most of them went back to their spot and ignored the others around them. I am waiting for them to publish their work now so that I can see how well they have done. Next week I am not going to enforce the silent time as I want to see how productive they are without my help. I will post some of their work to compare productivity and quality in each environment shortly. Last week I observed a funny situation in the class. One of my boys who doesn't necessarily engage with writing and struggles to stay motivated in class for long periods was acting in his usual manner. It was Monday and we had begun our writing of a narrative which was going to take two lessons to complete. He was sitting there day dreaming with hands on his chin and chatting happily with his friends from time to time, doing very little work. In fact very little is an understatement. Onto day two, Tuesday. The lesson begins as normal but this time he has fingers on his keyboard and I can hear the occasional tap. His friends are talking away like usual and then suddenly he gets up and moves to a quiet spot by himself without a word being said to his buddies. Now his head is down and there are a lot of fast little taps coming from his direction. Five minutes later one of his friends comes wandering over and starts talking and mucking around. He tries to look interested in what his friend is saying but he then notices me watching and stands up and moves again to another quiet spot. Five minutes later his friends turn up again and he looks at me and says to them leave me alone you guys are annoying me. From then on the same steps in the dance kept happening except I decided to keep cutting in. His friends are very active and as soon as my back was turned would try and sneak over. Basically I spent an hour running interference for him. His friends were for the most part on task, but they just like to talk about it a lot. So this all made me think about the difference between kids who need support and the comfort of their friends and those that just need some space and time to create on their own. How do I cater for both parties? Something for me to ponder. This is a presentation that shares some early findings regarding writing in my class. The purpose of this survey was to get some initial ideas about how the kids feel about writing and what interests them in writing. It is a work in progress so the presentation will change or be added to at times. I am a typical Kiwi bloke who loves his rugby and sport in general, so although I am to old and lazy to play rugby any more I can coach it. Our school has modified the size of our fields and purchased new rugby goal posts this year, so I had the idea that I could get my rugby boys and girls to mark out the field and goal post locations. I hope it will be interesting for them and that they will be motivated to do a good job because in the end they will be the users of their outcome. I will keep you posted how this goes over the next few weeks. Last week we had our school camp which is always a blast for all. Its a great chance for the kids to get outside of the classroom and outside of their comfort zone. I always enjoy seeing those kids that struggle in class suddenly shining in activities you wouldn't expect them to shine in. In terms of the boys, it's always great to see them becoming more vocal and confident in physical activities and activities that require problem solving. 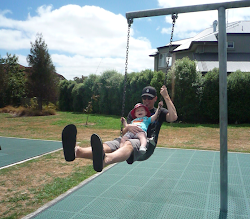 One of the boys favourite activities was eeling. Not surprising right? Well I can tell you there really was very little eeling involved. Firstly they had to talk about how the maori people would have caught eels before fishing lines could be bought from Rebel sports. They then had to make their own fishing line by weaving strands of Harakeke (flax) together. My group loved sitting down using their hands and challenging each other to see who could make the longest line. Give the boys something to make with their hands and the quiet descends as they work away. While making there lines the boys were able to experience great treat of eating some smoked fish. For some it was their first time trying smoked fish and judging by the amount of time it took to devour the fish right down to the bone, I would say it was a hit. I am thinking I might need to go fishing every weekend so I have a good supply of fish to motivate the boys in their work. I'm sure they would all work really hard to earn the reward of smoked fish each Friday. The activity concluded with some fishing off of the bridge across the creek. The boys were so well behaved and so into it even though we forgot the meat for bait. The boys were absolutely buzzing when two catfish surface to see what all the noise was that woke them. So I really need to get them using their hands and keep them well feed if I want the best out of them. Smoked fish anyone? I have recently seen an advertisement for how not to get kids writing and how not to get the best out of boys and their writing. The solution for the above is simple. TEST THEM. Sit them down and tell them they have 40 minutes to write to the best of their ability about a topic I have chosen. I wish I had filmed the first 10 minutes of this test. Kids sitting at their desks staring at their blank screens trying to come up with some ideas, others nervously looking at how much the person next to them has written. Of course some kids are fine and produce some pieces of quality but for the most part it is not the case. Anyway I don't mean this to be a negative post about assessment. Assessment has its place and I do value it. My reason for writing this is more about the fact that the boys, 90% of my class anyway, really aren't suited to this type of environment and struggle to write anything of great value. So my observation is - pressurized teacher chosen topics and environments of this extreme nature don't suit boys! This year I am going to take a closer look at the boys in my class and try and figure out what makes them tick when it comes to writing specifically, but also the other curriculum areas. I'm hoping as a byproduct I will end up with a toolkit of strategies and approaches to keeping boys motivated in class. Motivated to learn. Just a brief warning before I get started with my reflecting. I was one of those boys I am going to be researching when I was at school. I hated english and writing and it took a lot of pushing from my dad to get me reading before I started to enjoy reading books. So as I post you may notice that my grammer is not the best, I apologise for this in advance.